Nomsters, I don’t even know where to start. I had the opportunity to check out Duck Duck Goose for brunch with my buddy BmoreFood the other day, and I am so shook. Everything from ambiance to food was on point, and I for one am beyond stoked to go back for more. Louie and I started our meal off with La Vie En Rose ($12), and it was perfection in a cup. 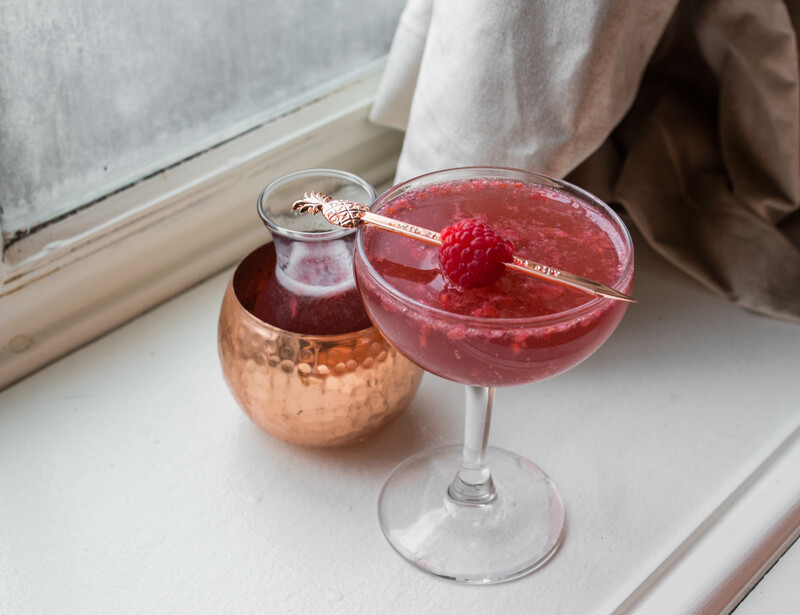 Made with vodka, raspberry liquor, raspberries, lemon and champagne, this cocktail was just the right amount of sweet. Plus, presentation was on point, but pretty much everything at Duck Duck Goose was instagram-worthy, like I’m not kidding. Even their wallpaper’s cute! Don’t believe me? Keep reading to see. French Toast + Nutella? There is a God. Louie and I got several dishes to share between the two of us because that’s just how we do. Standouts included their Nutella Stuffed French Toast ($9), their Shrimp and Grits ($17), and their DDG Burger. I was worried that the french toast was going to be overwhelmingly sweet, but it was well balanced, even when doused in maple syrup. It was as crisp as can be, and the ratio between spread and bread (hardy har har) was perfect. Next up: their Shrimp & Grits. 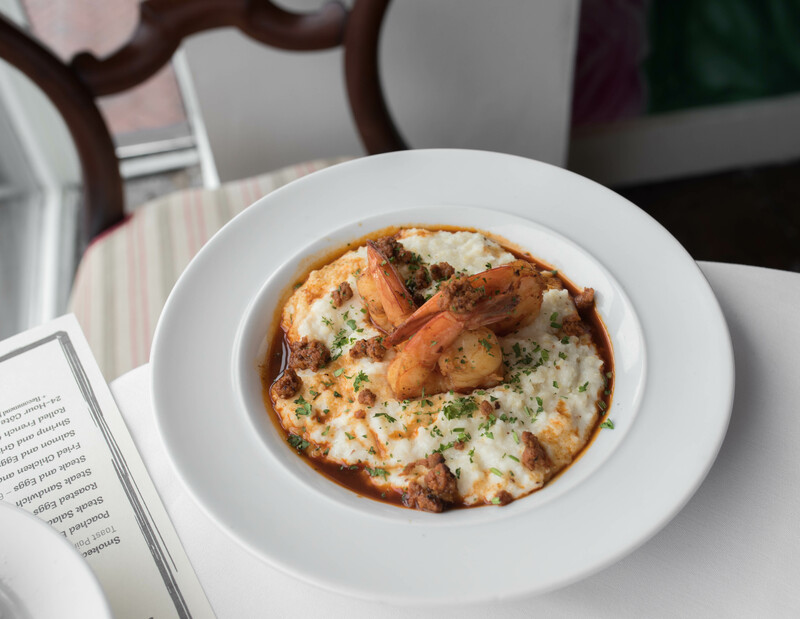 This dish came with 3 ginormous pieces of perfectly cooked shrimpies with chorizo on top of super creamy grits. I shot this for a good 15 minutes, and it was still delicious when I devoured it cold. Curious to see if you guys like this dish as well – I feel like it’s an entree that you either love or hate. Thoughts? 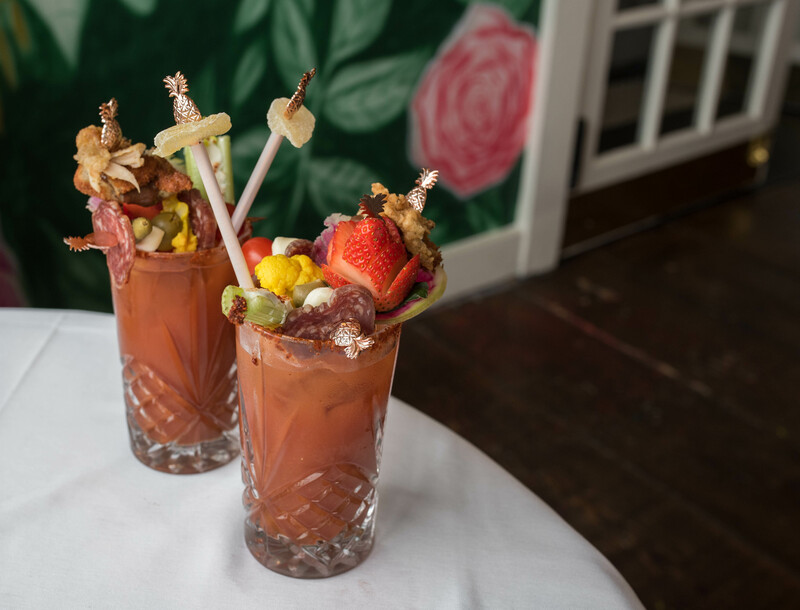 I’m actually not a huge drinker, but who could resist these Bloody Marys! Can we just talk about these garnishes though? I told you everything here was instagram-worthy. I’m low-key obsessed with pineapples so I legit freaked out when they brought these dranks out (along with oyster shooters, eyyyy). The Craziest Burger in Baltimore? Andddd I saved the best for last because I really wanted to wow you guys. People have mixed feelings about this burger because it’s SO freakin’ rich, but I honestly loved it. In fact, I’d go as far as to say it was one of the best burgers I’ve ever had. I only ate like 1/3 of it because I was so full, but I highly recommend getting it, especially if you go with a group so y’all can try a bite. 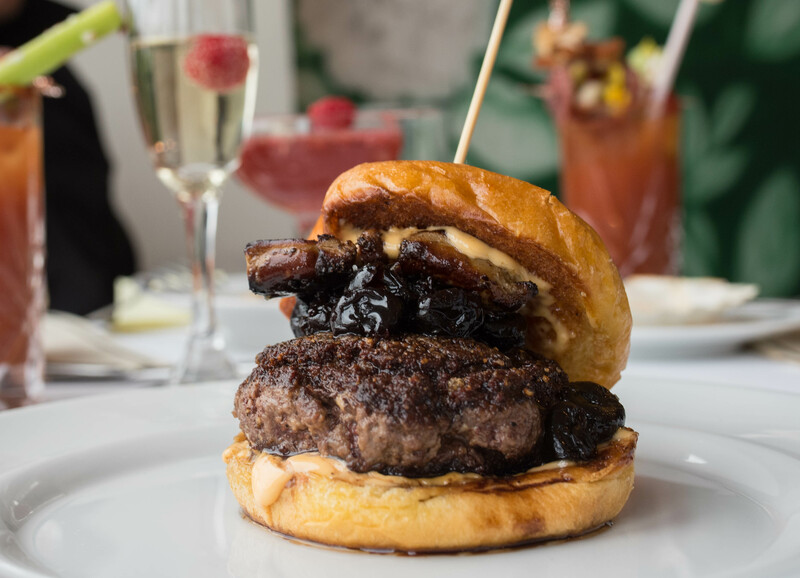 The DDG burger is juicy magic topped with foie gras and reduced cherries, served on a brioche bun that slathered with spicy mayo. Yeah, I told you it was crazy. What do you guys think? Would you give this baby a try? Anywho, I hope you guys enjoyed reading all about Duck Duck Goose. Which dish did you like best? And if you’re familiar with Fells Point, where do you like to go for brunch? 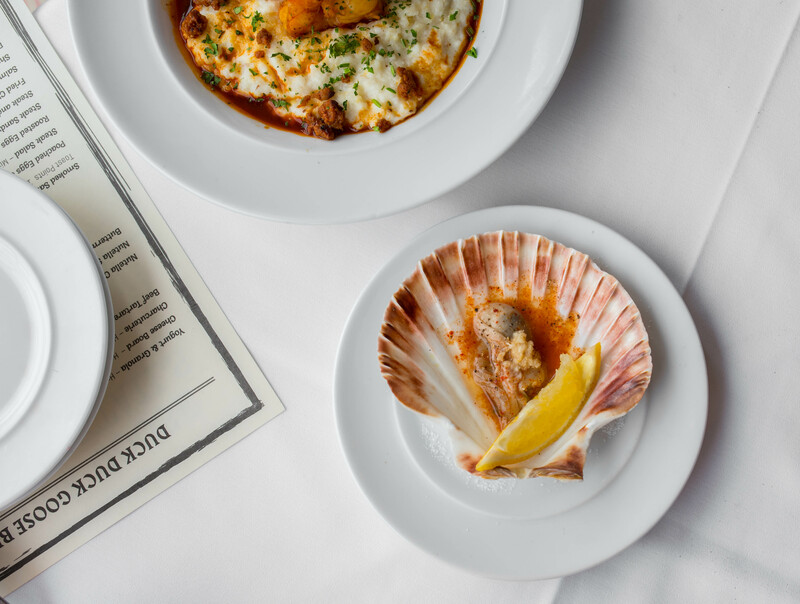 I’m always looking for new restaurants to try so definitely let me know below. For more MD foodporn, click here to get your browse on! And FYI, Robby and I post new content every Monday and Thursday so definitely make sure to check back soon. Happy eating, friends! 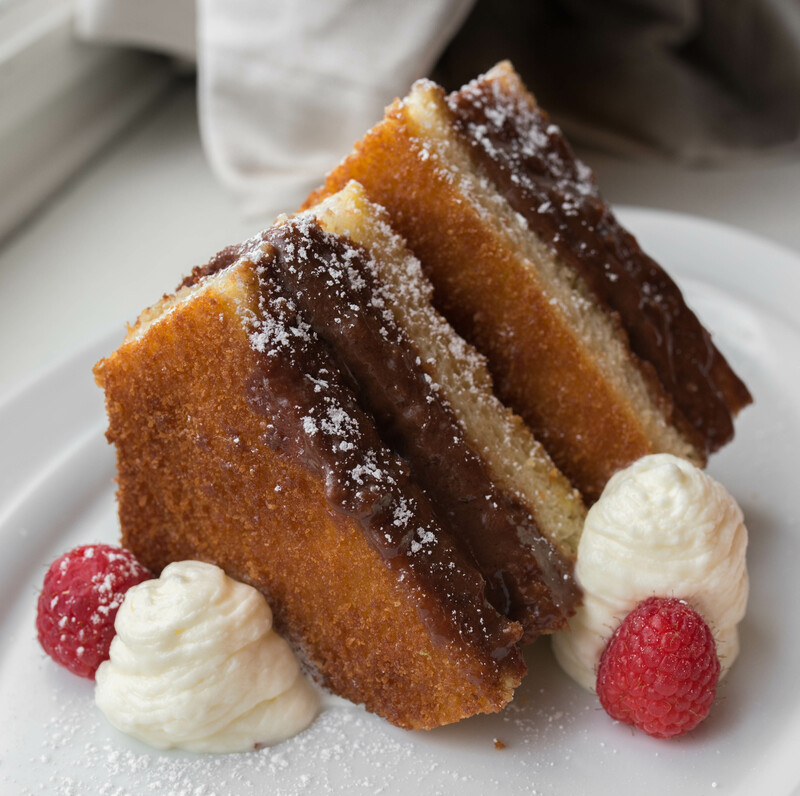 La Calle: The Best Dessert in Baltimore? Next Post Sam Choy’s Poke to the Max!